Just 8km south of Sydney CBD Coogee is well known for its beautiful beach, popular amongst families for its safe swimming conditions. Our next re-roof takes us to a unit block on one of the main roads forming the boundary of Coogee and due to this parking did not come easy to us. It was a difficult site with poor access and poor storage. First up Sydney Safe-T-Rail encountered a slight delay due to no parking. When he was finally able to get a park close enough to our site it did not take long to erect rail for us to get started. With 14 pallets of Boral tiles waiting for us, we started stripping the existing main roof covering. Normally we would pull the old tiles up and throw them straight into the back of our empty tipper below. However with poor access to the property we were unable to get our truck close enough to carry out our normal practice. Instead we used our Hytile trolley elevator to elevate the old tiles down to ground, then a short walk to throw into the tipper truck. As soon as the truck is full our truck driver Tony then drives straight to the tip, returning as quickly as possible to continue stripping. In the meantime we lay heavy duty sarking supplied by Sydney Roof and Building Supplies and using a Paslode Bradder gun we nail the battens down, ready for new tiles to be laid. We then stack new French terracotta tiles 10 high onto elevator trolley. Once the tiles reach the top we stack them in position ready to be laid in place. The tiles are fixed every second course with 65mm galvanized clout nails. At the end of each day it generally takes about an hour to ensure all areas of the roof are water tight, covering areas with tarps if necessary before packing up all tools, materials and rubbish to head home. Each day completing section by section of re-roof, this is time efficient and helps us to keep the roof watertight at all times. 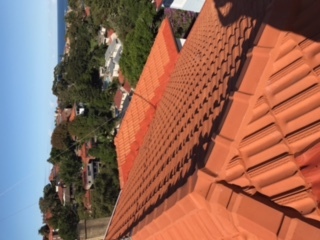 Once the roof covering is complete we fix terracotta ridge and hip caps, using flexipoint cement mix the same colour as the new Boral tiles, and replace all valley irons with new colourbond valleys. As well as installing a new roof we also fixed new dektites to all flues and new lead work to chimney dutch gables. We removed timber work to rear dutch gable and fixed new cladding, barge and cover boards in place. To finish off, as with most re-roofs, we installed leaf screen to all gutter lines and valley lines. We use poly mesh in colour terracotta to match brand new tiles, fixing under second course of tile and to gutter using dark brown trim to match and blend with the existing gutters.